creates a significant positive impact on the business community and generates a return on investment to its major stakeholder groups—students, taxpayers, and society. Using a two-pronged approach that involves an economic impact analysis and an investment analysis, this study calculates the benefits received by each of these groups. Results of the analysis reflect fiscal year (FY) 2016-17. WCC employed 1,451 full-time and part-time employees in FY 2016-17. Payroll amounted to $77.4 million, much of which was spent in Washtenaw County to purchase groceries, clothing, and other household goods and services. The college spent another $44.1 million to support its day-to-day operations. 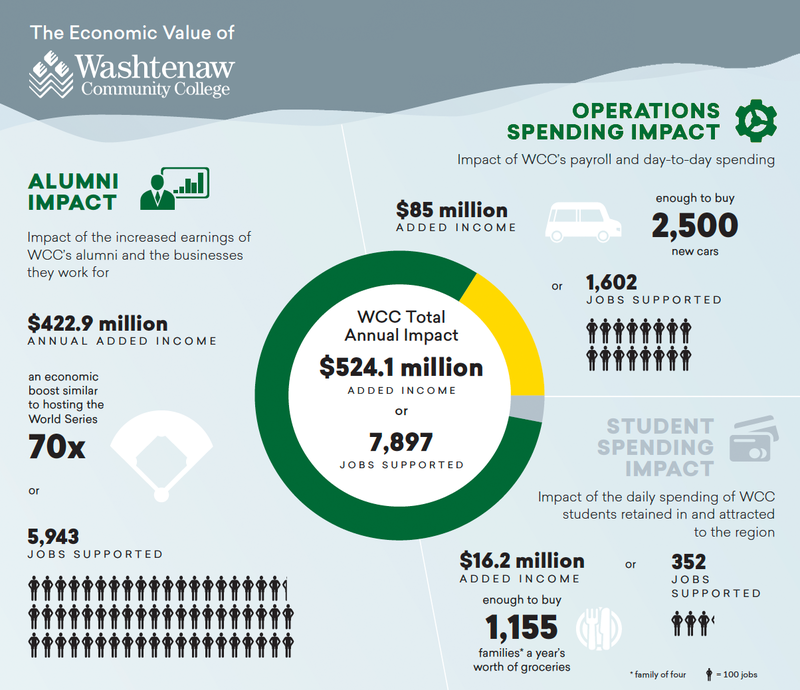 The net impact of college payroll and expenses in Washtenaw County during the analysis year was approximately $85 million in income. Around 41% of credit students attending WCC originated from outside the county. Some of these students relocated to Washtenaw County. In addition, a number of students would have left the county if not for WCC. These relocated and retained students spent money on groceries, transportation, rent, and so on at county businesses. The expenditures of relocated and retained students during the analysis year added approximately $16.2 million in income to the Washtenaw County economy. Over the years, students have studied at WCC and entered or re-entered the workforce with newly-acquired skills. Today, thousands of these former students are employed in Washtenaw County. The impact of former students currently employed in the county workforce amounted to $422.9 million in added income during the analysis year. WCC’s FY 2016-17 students paid a total present value of $33 million to cover the cost of tuition, fees, supplies, and interest on student loans. They also forwent $64.9 million in money that they would have earned had they been working instead of learning. In return for the monies invested in the college, students will receive a present value of $682.7 million in increased earnings over their working lives. This translates to a return of $7.00 in higher future earnings for every dollar that students invest in their education. The average annual return for students is 24.3%. In FY 2016-17, state and local taxpayers in Michigan paid $69.7 million to support the operations of WCC. The net present value of the added tax revenue stemming from the students’ higher lifetime earnings and the increased output of businesses amounts to $270.7 million in benefits to taxpayers. Savings to the public sector add another $15 million in benefits due to a reduced demand for government-funded services in Michigan. Dividing benefits to taxpayers by the associated costs yields a 4.1 benefit-cost ratio, i.e., every dollar in costs returns $4.10 in benefits. The average annual return on investment for taxpayers is 11.6%. The economic base in Michigan will grow by $3.1 billion over the course of the students’ working lives due to students’ higher earnings and increased business output. Society will also benefit from $50 million in present value social savings related to reduced crime, lower unemployment, and increased health and well-being across the state. For every dollar that society spent on WCC FY 2016-17 educations, society will receive a cumulative value of $16.00 in benefits, for as long as the FY 2016-17 student population at WCC remains active in the state workforce.